A recent article over at Zelda Universe has been written and it discusses the Geography and Cartography of Hyrule. In particular it takes a look at the different Hyrule overworld maps in the various Zelda games and how they relate to one another. The author proclaims that all the lands known as Hyrule are in fact the same place. In some cases it’s blatantly obvious that the overworlds are in fact related, such as the case with the Legend of Zelda and Zelda II: The Adventure of Link. 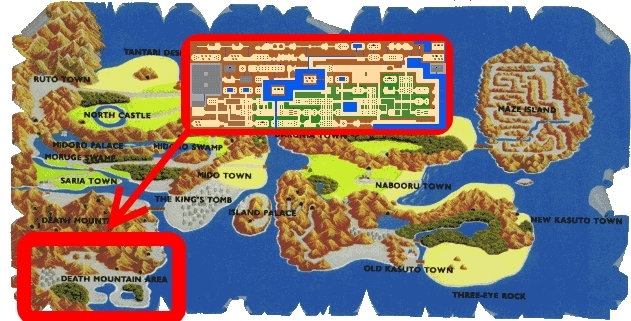 The author has created an image, showing that the southwest corner of the the overworld in Adventure of Link is in fact the land that we navigated across in the original Legend of Zelda. Other than the obvious similarities between the first two Zelda titles, I think the similarities end right there. 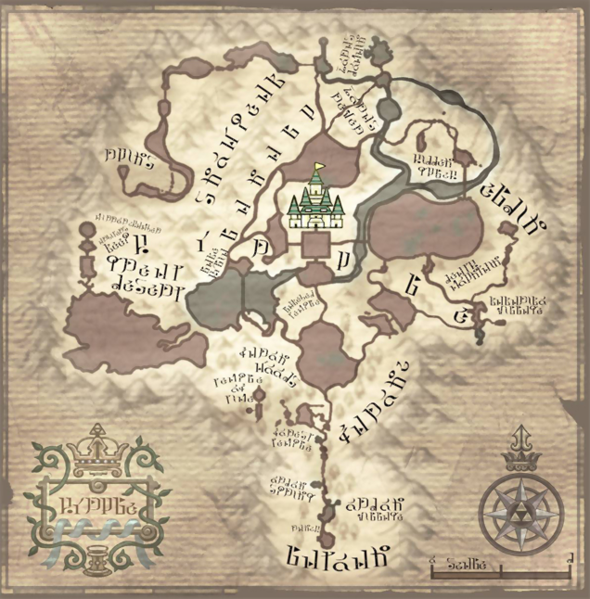 The author tries to show comparisons between the A Link to the Past overworld map and a slanted version of the Ocarina of Time map. You can see this edited comparison here and look for yourself. I often times see these types of comparisons when discussing timeline related issues. In fact, it often times stretches outside the realm of just Hyrule with comparisons between the lands of Holodrum and Koholint, in order to try to prove some sort of similarity which somehow supports a games placement in the timeline. Whenever I look at these comparisons there are a few things that always stand out to me. Way too often, people are looking at the things that could possibly fit, and they are disregarding the things that obviously do not fit at all. Let’s look at that A Link to the Past and Ocarina of Time comparison once again. After tilting Ocarina of Time’s Hyrule, I do see how Hyrule Castle, Death Mountain, Zora’s River, Lake Hylia, and The Desert Colossus fit in nicely. However, let’s look at the things that just don’t seem to matchup at all. 1. Kakariko Village is the obvious one that comes to mind. In Ocarina of Time it is just east of the Castle, while in A Link to the Past it is far west of Hyrule Castle. Perhaps you can look at this from a timeline perspective and relate this to Twilight Princess. If you place A Link to the Past on the child timeline, the order would go, Ocarina of Time > Twilight Princess > A Link to the Past, (with other games or events fitting in between these titles). The problem with this chronology is that it is backwards. Ocarina of Time’s Kakariko Village is right next to Hyrule Castle and it leads to Death Mountain. Its location correlates well with the Hidden Village of Twilight Princess, but that is nowhere near Death Mountain. In fact, it is the new Kakariko Village in Twilight Princess that is close to the entrance of Death Mountain. Furthermore, in A Link to the Past, Kakariko Village is far wast of Hyrule Castle. Assuming that the gamecube version of Twilight Princess is cannon, this places the new Kakariko Village far east of Hyrule Castle, which again, is quite a big contradiction. Whatever way you try to look at it, there is huge inconsistencies in the placement of Kakariko Village. 2. The Lost Woods and the Master Sword. Looking at the tilted Ocarina of Time map, the Lost Woods are located far to the east while the Master Sword is located in the Temple of Time just near the Castle. However, in Twilight Princess the Lost Woods are far south of Hyrule Castle, with the Temple of Time now being in ruins and nowhere near the castle. Furthermore, in A Link to the Past, there is no resemblance of the Temple of Time at all, and this time the Lost Woods are now northwest of Hyrule Castle. So in three games, going in chronological order, the Temple of Time has apparently moved, the location of the master sword seemingly moved, and the Lost Woods have also moved. 3. Miscellaneous locations. There are a bunch of locations in both the A Link to the Past and Ocarina of Time overworlds that just do not account for one another in the other map. The east end of A Link to Past, just south of Zora’s River, is an area of ruins where the Eastern Palace is located. In Ocarina of Time, this area is the Lost Woods. Does this mean in the time period between the two games, the woods seemingly vanished and the Forest Temple eventually became the Eastern Palace? What about Twilight Princess then? In the east there was Kakariko Village, Death Mountain, and the Goron Mines? How does that fit in? What about the area between Lake Hylia and the Desert? In Ocarina of Time this area is occupied by Gerudo valley with a river running through, flowing towards Lake Hylia. While its A Link to the Past counterpart has a large open swampy area. And Twilight Princess? Well, the Lake and the Desert are adjacent to one another with nothing more than a large cliff separating the two. The end result is, when looking at the Geography of Hyrule, if you are specifically looking for comparisons, you’ll find them, but that doesn’t mean you can blind yourself from the stark contradictions that can easily be identified. I feel that the geography has proven to be an inconsistent way to try to form some sort of chronology within the series and it should be taken with a grain of salt and nothing more. Perhaps Bastian is right in his article and that the Cartographers that created the maps were just off and the maps are there interpretations of the lands and not necessarily the actuality of them. Who really knows. We’ll just have to wait and see what Hyrule looks like in the next title and how that fits in geographically and chronologically with the rest of the Zelda games.